Charles Pratt was born in Wellington, New Zealand, in 1891 and was cadet with the First Wellington Rifle Company. When war broke out he quickly enlisted and saw action in Gallipoli. 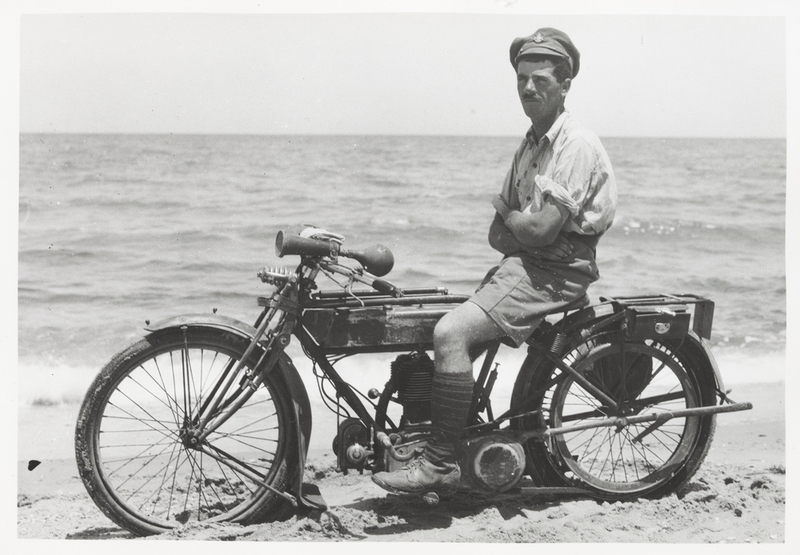 He was later promoted to rank of corporal, and served as a mounted motorcycle despatch rider in Egypt and Palestine. In 1917 he volunteered for the Royal Flying Corps and quickly found his calling. He was a natural pilot and soon began teaching others. Chris Pratt, taken from his 1st World War album. After the war, Charles boarded the Steamer “Cooee” for the voyage back to New Zealand along with four crated aeroplanes and intentions of establishing an aviation business. However, a dock strike saw him stranded in Melbourne. Charles had become friendly with the Captain of the “Cooee”, and persuaded him to unload one of the crates containing a DH-6 aeroplane onto the wharf. From there he proceeded to assemble it and, once ready, took off from that very wharf. During the enforced stay in Melbourne, Charles explored the region and realised that there was potential for his business here. He established himself in Geelong where he remained until moving to Essendon in 1938. Soon after setting up in Geelong he convinced his three brother to join him. Two of his brothers, Percy and Len, were taught to fly and helped with the business, while the third brother, Alf, was to operate a motorcycle courier business. One of Charles Pratt’s business endeavours was aerial photography. 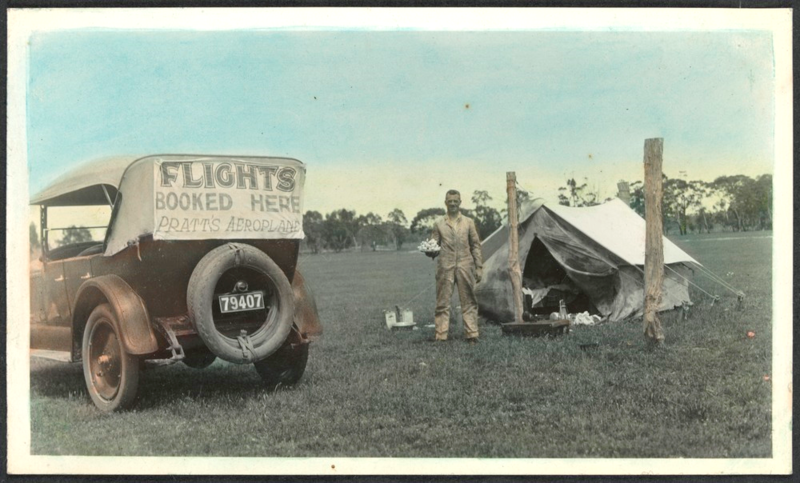 The State Library of Victoria holds a vast collection of his aerial photographs as well as family photographs and albums of photographs depicting his time at war. Of his aerial photographs, over 1,300 can be viewed on-line. These aerial photographs display as zoom-able jpegs. The image below shows the detail that can be obtained at the maximum zoom. Here, outlined in red is the area that has been zoomed into. 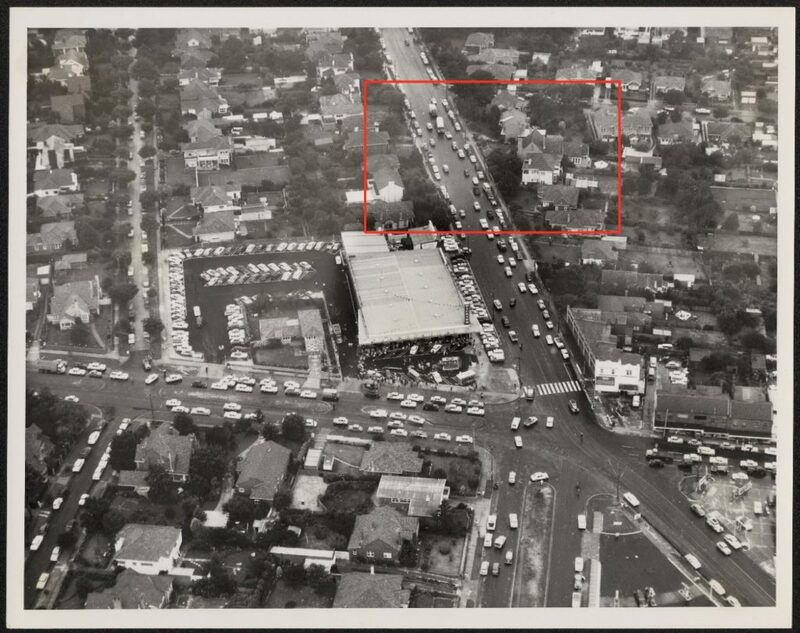 Aerial view of High Street and Burke Road junction, East Kew. 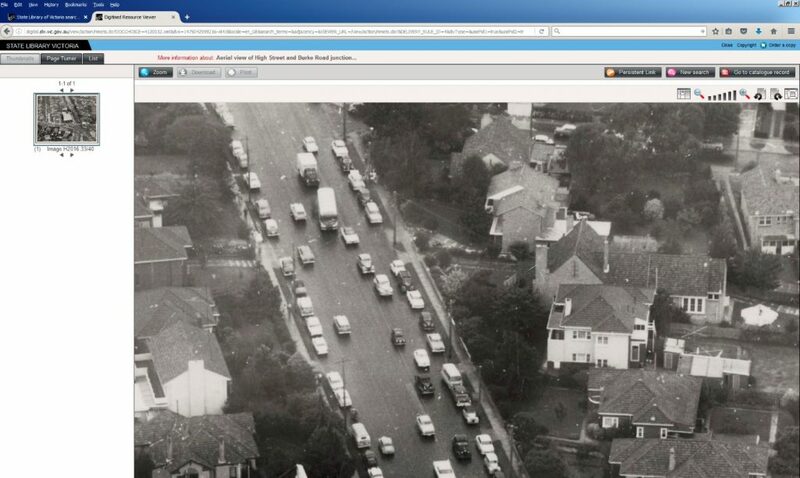 These aerial photographs were scanned by the Image Access team using an Epson Expression 11000 XL. This scanner can take up to A3 size flat works and most items are digitised to approximately 60 Mb. While larger files can be created, a 60Mb file is equivalent to an A3 reproduction at 300 ppi and is the standard that we use for these types of items. From the TIF file, a zoomable jpg is created at 72 ppi while preserving the file size. The resultant JPG can be zoomed in to, giving the opportunity to study the image more closely. This collection of aerial photographs was assembled by John Etkins, who was an avid collector of pictorial works. 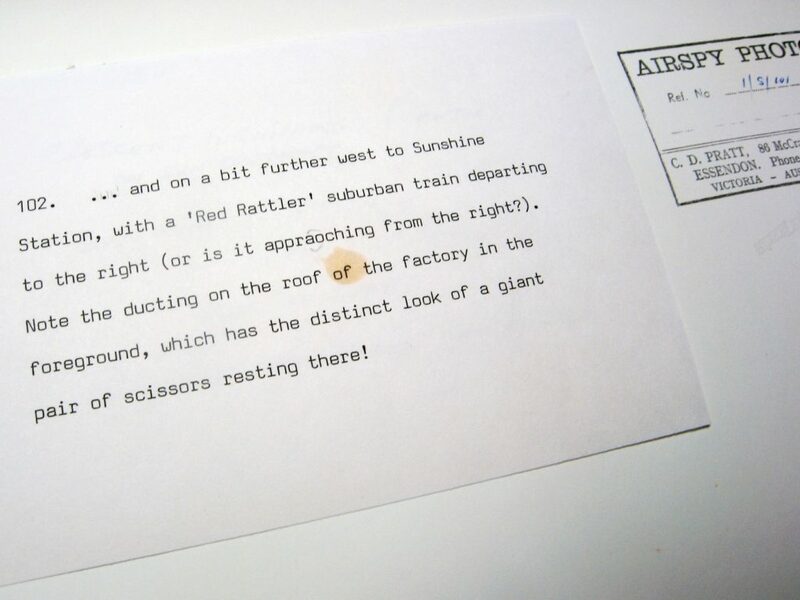 To the rear of the photographs, John Etkins added his own type written descriptions, some of which are quite amusing. Rear of Aerial view of the Melbourne Showgrounds, Victoria. Rear of Aerial view of Sunshine, Victoria. Here we are zoomed into those aforementioned scissors. Detail of Aerial view of Sunshine, Victoria. These aerial views of Melbourne cover many suburbs and rural locations from Coburg, all the way to Lakes Entrance. They document some of our most historic buildings, including the Queen Victoria Market, Carlton United Brewery, the Melbourne Cricket Ground, and the University of Melbourne. AHSA Newsletter (2013) Volume 29 Number 1. 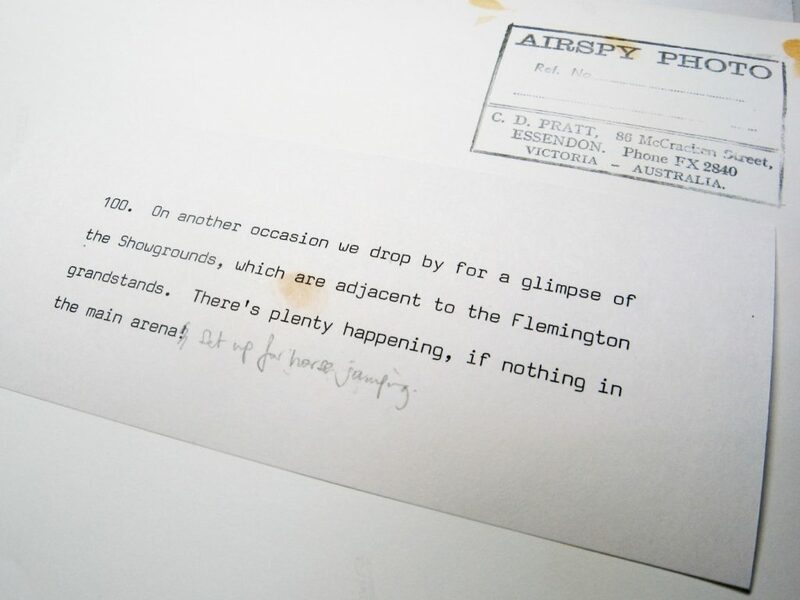 Kevin O’Reilly (2012) Flyers of Time – pioneer aviation in country Victoria: the first fifty years, a collection. 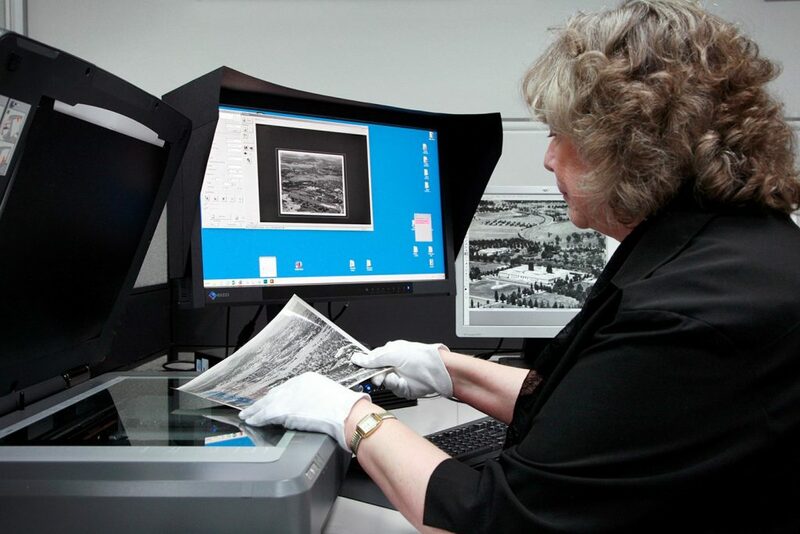 Where can we view the collection of Aerial Photographs that have been digitised? To search for images relating to the Charles Pratt family, use Charles Pratt collection. Photographs. To search for Airspy aerial photographs (not all of which are by Charles Pratt) use, Airspy collection : photographs. or Airspy collection of aerial photographs. To search by photographs by Charles Pratt, use Charles Daniel Pratt 1892-1968 photographer.